It’s not often that we’re able to write about someone leading a tournament during both Friday’s and Monday’s newsletters. That is exactly what will happen today as Cameron Champ went wire to wire to win the Sanderson Farms in Mississippi this weekend. Across the world, we also had Xander Schauffele chase down Tony Finau to win the WGC HSBC Champions and Nelly Korda win in Taiwan. Unsurprisingly, Champ led the field in driving distance this week (334 avg.) and was second in strokes gained off the tee. He also finished second in strokes gained putting as he earned more than 9 shots on the field with the flatstick. Starting the day in shaky form, Champ recovered to birdie five of his last six holes to storm to victory. The rise of Champ is going to further the discussion of distance in the world of golf. The guy hits the ball 340 yards with ease and is going to be a polarizing figure. We’ll leave the full discussion of this to Andy and Brendan on the Shotgun Start, but here’s one basic question in regards to this issue: what is the harm in protecting the integrity of golf courses instead of the bottom lines of equipment manufacturers? Four shots back of Champ and in solo second was Corey Conners. 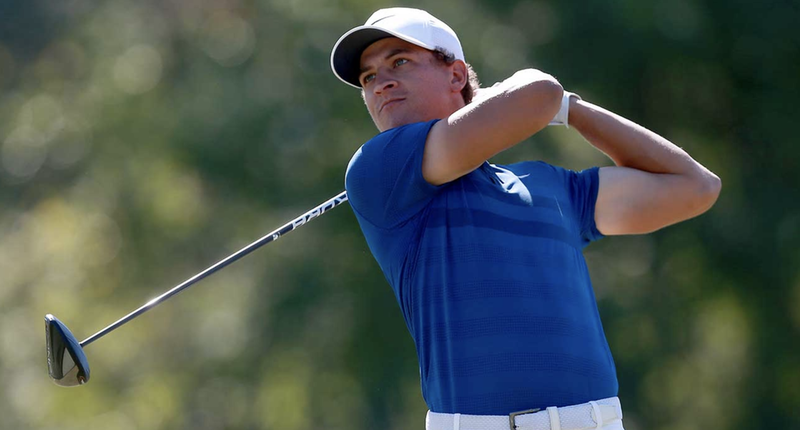 The Canadian jumped onto the PGA Tour scene with his performance (through 3 rounds) at the 2018 Valspar, but he has struggled to get back into contention. This runner-up finish is the best of his career and hopefully sets him up for a breakout season. New Comers - As is tradition at the Sanderson Farms, the Web.com Tour graduates really showed their talents this weekend. The top 10 was littered with rookies and Web graduates, and it really warms my heart to see them out succeeding on the big tour. Keep it up boys. Bill Haas - One guy who did miss the top 10 was Bill Haas. He failed to keep his full tour card last season and is living semi week-to-week right now. He missed a 6-footer on 18 that would have gotten him an exemption into the Vegas event next week via a top-10 finish at Sanderson. Just goes to show that even big name guys can struggle to gain consistent starts. This victory marks the 3rd in the young career of Schauffele and further cements his name amongst the 2011 high school class with which we have become all too familiar. Xander made 6 birdies in his final round to come from 3 back and ultimately chase down Finau in a playoff. He will move up to 12th in the world, the highest of his career. The fact that Tony Finau only has one PGA Tour victory is baffling. The guy is always in contention and racks up top 10s like it’s nobody’s business. Still, the runner-up finish adds to what has been a spectacular year for Finau and will move him up to 15th in the world rankings. Ryder Cuppers - It was a pretty solid WGC for players on the U.S. and European Ryder Cup teams. Finau, Patrick Reed, Justin Rose, Thorbjorn Olesen, and Tommy Fleetwood all finished inside the top 10 this week. Haotong - Playing in his first WGC HSBC in his home country, Haotong Li finished T-11 in front of his home crowd. He birdied four of his final six holes to shoot up the leaderboard and give the fans something to cheer about. Andy is joined by the head coach of the Yale Golf Team, Colin Sheehan, for a two-part part podcast. In part 1, they discuss coaching college golf, the Yale Golf Course and Colin’s book on the history of the U.S. Amateur. Listen to part I of the podcast on iTunes, Stitcher and Spotify.